Stock #A208SS:IMMACULATE!!! 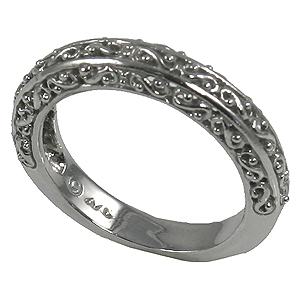 Antique Style Fancy Filigree Wedding Ring.....Sterling Silver.... 3 mm wide!!! Gorgeous hand-made piece!!! Fits best with styles A204SS. Beautiful, Heavy, Hand-Crafted, top quality Jewelry workmanship!!! New style!!! Also available in 14k yellow gold, white gold, rose gold, and platinum.